The wall surrounding Angkor Thom forms a square. Each side is 3 kilometers long, with a height of 8 meters. 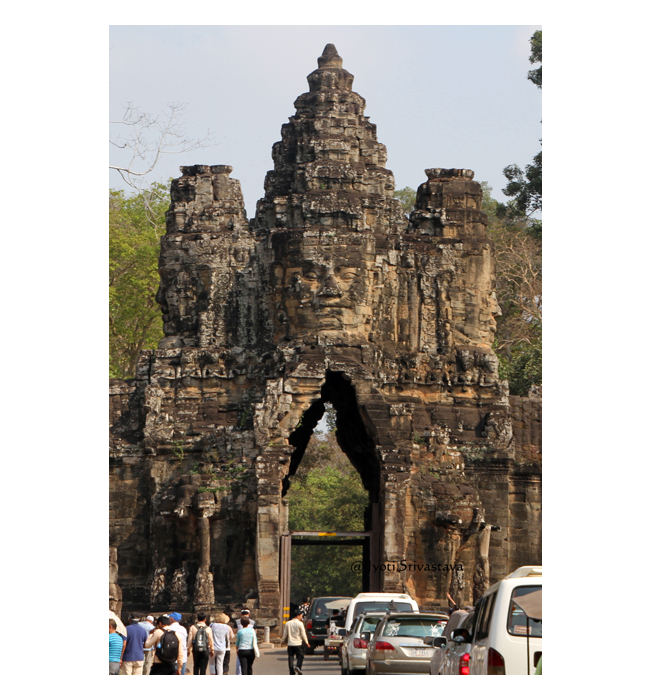 Gates of Angkor Thom are a part of UNESCO World Heritage Site [WHS], as part of Angkor Archaeological Park, which was listed in 1992. Angkor Archaeological Park contains the magnificent remains of the different capitals of the Khmer Empire, from the 9th to the 15th century. They include the famous Temple of Angkor Wat , and also monuments like Bayon, Baphoun, Elephant Terrace, Ta Prohm, Preah Khan, and Banteay Srei. 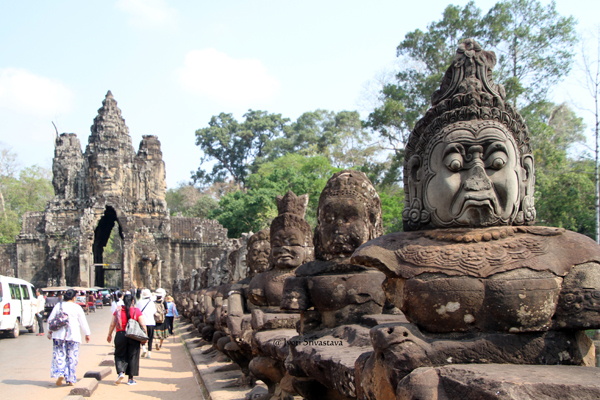 Two rows of giant-figures each carry the body of seven-headed naga – Gates of Angkor Thom / Siem Reap, Cambodia. Angkor Thom was built was Jayavarman VII (1181 – 1215). He is the greatest of all Khmer rulers. He waged war against Champa and conquered much of their land. Jayavarman VII was a follower of Mahayana Buddhism and made this Khmer’s new religion. He built a new city Angkor Thom, with Bayon as the city-capital. 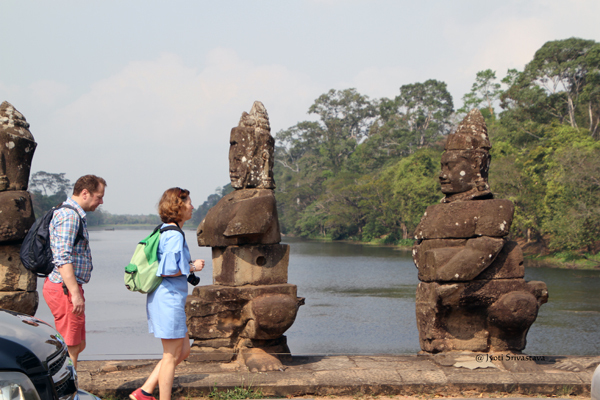 Angkor Thom is a walled city. The wall surrounding Angkor Thom forms a square. Each side is 3 kilometers long, with a height of 8 meters. A 100 meters moat surrounds the outside of the wall. The moat could only be crossed at 5 locations. 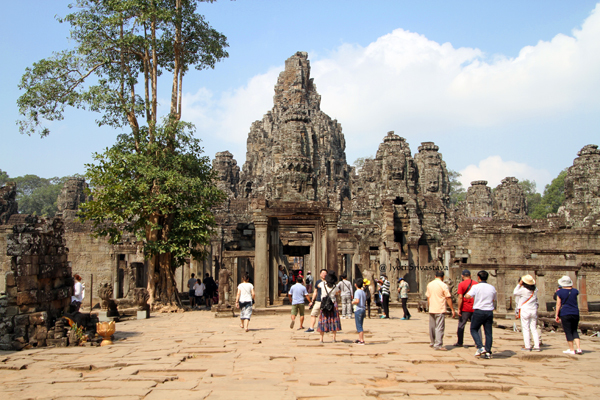 The four gateways in the city wall – north, south, east, west – lead to the city’s geometric center – the Bayon. The fifth – the Victory Gate – lead to the Royal Palace. 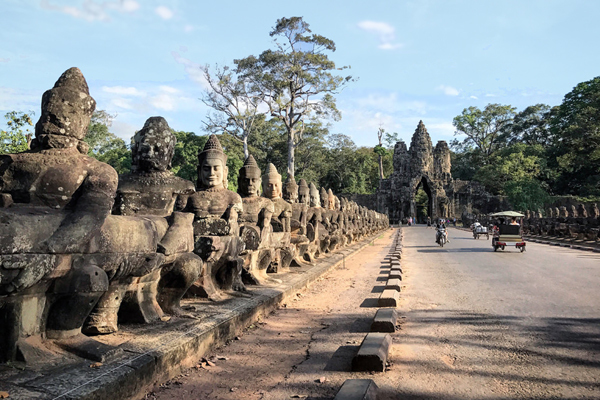 The South Gate provides the most common access to Angkor Thom, as it site in the path between two great Angkor complexes [Angkor Wat and Angkor Thom]. On the left are serene-looking giant gods [devas] – Gates of Angkor Thom / Siem Reap, Cambodia. The causeways that cross the moat, have a row of 54 giant figures on each side. On the left are serene-looking giant gods [devas] and on the right are fierce-looking giant demons [asuras]. The two rows of giant-figures each carry the body of seven-headed naga. It has been suggested that the giants are involved in churning the sea of milk. 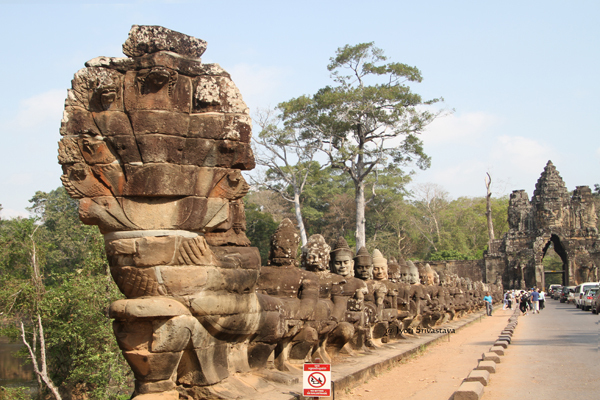 On the right are fierce-looking giant demons [asuras] – Gates of Angkor Thom / Siem Reap, Cambodia. Indra on three-headed stone elephant Airavata, the vehicle of Indra – Gates of Angkor Thom / Siem Reap, Cambodia. The flanks on each gateway are decorated by three-headed stone elephant Airavata, a vehicle of Indra. Above Airavata are the damaged and weathered statues of Indra and devas. Airavata who appeared from the waves when the devas and the asuras churned the ocean. The above image shows the rows of devas on left and asuras on right. It also shows the three-headed elephant Airavata, and the faces of Indra and devatas in the center. 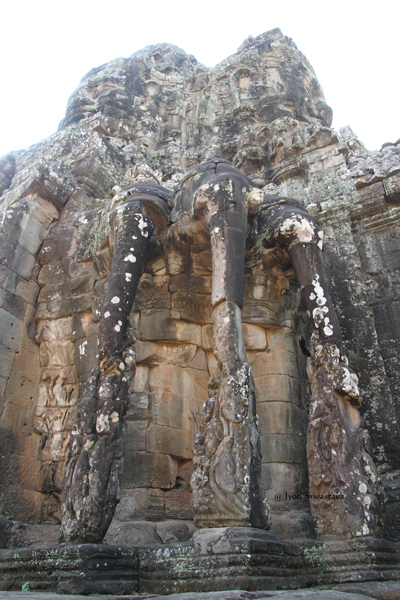 Closer look at Airavata – three headed elephant, the vehicle of Indra – Gates of Angkor Thom / Siem Reap, Cambodia. the three-headed elephant Gates of Angkor Thom / Siem Reap, Cambodia. Moat that surrounds the walled city of Angkor Thom -Gates of Angkor Thom / Siem Reap, Cambodia. 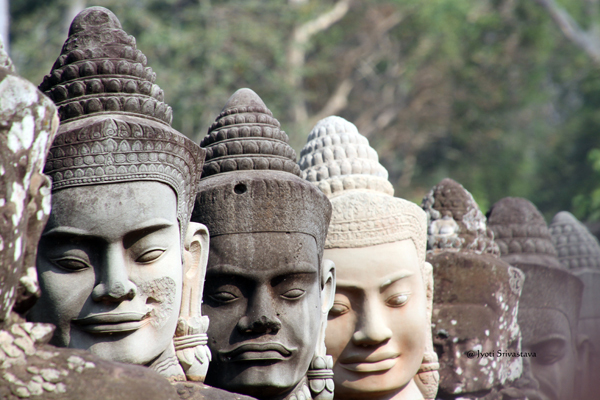 Another look at the serene faces of devas – Gates of Angkor Thom / Siem Reap, Cambodia. 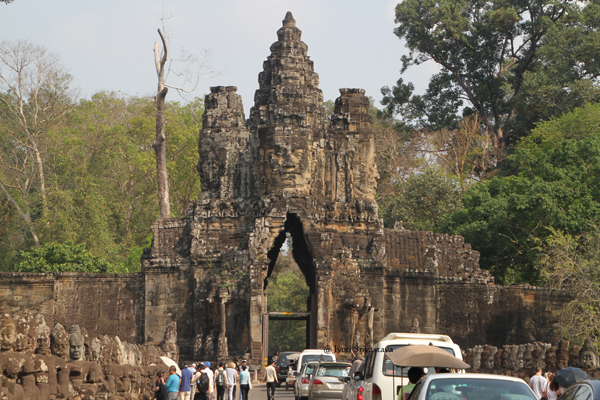 Gates of Angkor Thom lead to Bayon – capital of the walled city. / Siem Reap, Cambodia.